Why is Rundll.exe Maxing Out My CPU? Overview - What is Rundll.exe? Rundll.exe is an application that runs as part of your Windows operating system. Its main and only task is to access DLL files and run code. This is because DLL files cannot run code by themselves. Rundll.exe is an integral part of Window, and can be found in C:\Windows\System32. Your computer cannot run properly without it, and should not be deleted or moved from this location. 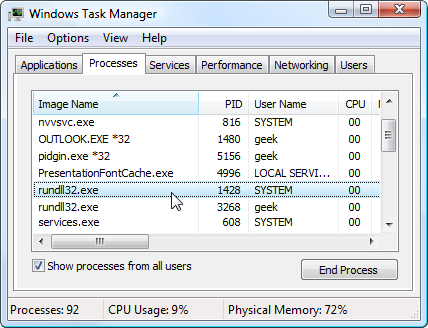 If you run Task Manager, you may see more than one copy of Rundll32.exe in operation. In normal circumstances this is normal behavior, but if the processes are taking up and excessive amount of RAM and CPU power, then Rundll.exe should be investigated for potential virus activity. You will not normally see any error messages regarding Rundll.exe, unless of course it's missing. If that's the case then your computer will not operate correctly, and you will need to run your Windows repair disk, or a Windows stability program in order to restore your system. Because Rundll.exe is an executable file that is commonly used by Windows, it makes a great target for viruses and malware to infect, because it will appear to be a legitimate program. You may only notice a problem if your system starts behaving erratically. One of the easiest ways to find out if you have a Rundll.exe infection is to look at your CPU usage from the "Task Manager". If Rundll.exe is not infected it will take up hardly any processor power. Between 1% and 5% is normal. If however you're seeing your CPU using between 95% and 100% with the Rundll.exe process, then it's likely you have a problem. You should also look at your Rundll.exe process to see where it's running from. Sometimes viruses put a fake Rundll.exe file somewhere on your computer. The only legitimate Rundll.exe file running should be in your windows\system32 folder. Run Anti-Virus and Anti-Malware software. Running programs to remove malicious software is the most effective way of dealing with this type of problem. After doing so, you may want to run a Reimage scan to re-stabalise your operating system. You can restore your system back to a previous restore point using Windows System Restore. Make sure you choose a date that is well before when you believe the problem started. Do a Windows Repair from your Windows disk. In order to do this you will need to restart your computer with your Windows disk inserted. Follow the instruction to repair your operating system. If your Rundll.exe file is damaged or corrupt then it will be replaced with a new one. Afterdoing this, it's still recommended to run Anti-virus and Anti-Malware software.